With immense experience and ample knowledge we are offering a wide range of Filter Element Spin-On. The working pressure 35 bar (508 psi), flow rates up to 250 l/min (66 gpm), threaded connections from 3/4” to 1 1/2” BSP/NPT/SAE. These Filter Element Spin-Ons have nicely been developed and constructed in a very advanced and latest manner at leading manufacturing companies which we are engaged in supplying and trading all over the country and also at very exclusive prices. 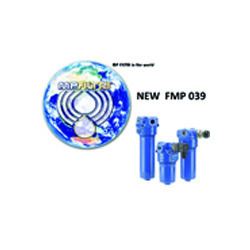 UFM 050 Mobile Filtration Units suitable for filling and refilling of filtered hydraulic fluids and lubrication tanks. The filter unit connected to off-line to the tank (recommended maximum volume of 500/750 ltr. ), can be used as a support to the filtration plant on start-up for fast flushing action, either as additional filtration systems with a high incidence of contamination. Continued use is recommended for the version with three phase electric motor. 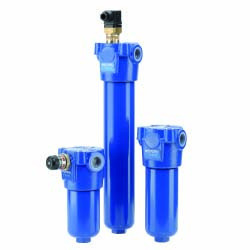 UMF 090 – 180 Mobile Filtration units suitable for filling and refilling of filtered hydraulic fluids and lubrication tanks. The filter unit connected to off-line to the tank, can be used as a support to the filtration plant on start-up for fast flushing action, either as additional filtration systems with a high incidence of contamination. 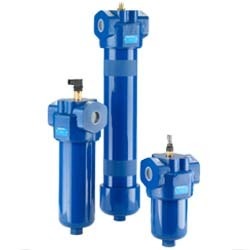 We are one of the very widely known and reputed companies which are engaged in supplying and trading for these top quality Mobile Filtration Units. 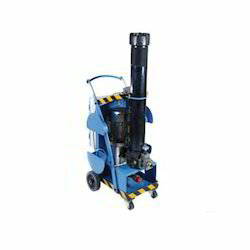 UFM 050 mobile filtration units are one of the top quality filtration units which are suitable for filling and refilling of filtered hydraulic fluids and lubrication tanks in several industries. 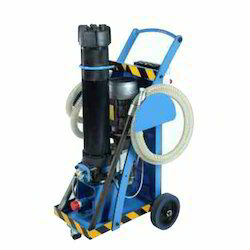 Our clients can obtain these mobile filtration units at a very conventional range of prices in the market. UMF 040 mobile filtration units suitable for filling and refilling of filtered hydraulic fluids and lubrication tanks. Enriched with long years of experience in the industry, we are able to supply premium quality array of Side Manifold Mounted Pressure Filter. 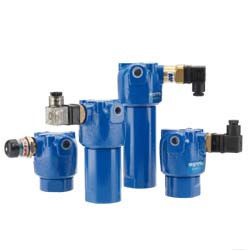 These have working pressure 320 bar (4641 psi), flow rates up to 490 l/min (130 GPM)side manifold connections. 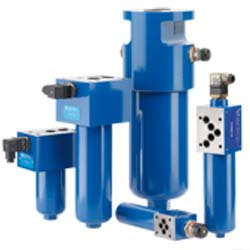 These side manifold mounted filters are able to provide excellent filtration functionality made from premium grade materials that are fabricated using modern technology. Our company’s immense infrastructural and corporate coordination helps us in bringing forth to our valued clients one of the finest and top quality New Return Filter Multiports. These New Return Filter Multiports have excellently been fabricated and manufactured at our company using superb and long lasting material quality. We are offering these to our clients in each and every part of the country as well as are trading also for it. 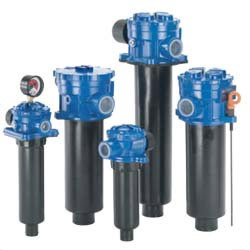 Along with several other supreme quality industrial filters, we have also brought forth to our clients these top grade and finest quality In Line Duplex Filter. The working pressure is 350 bar (5076 psi), flow rates up to 345 l/min (92 gpm), threaded connections from 1/2” to 1 1/4” BSP/NPT/SAE and flanged connections 1 1/2” SAE 6000 PSI. 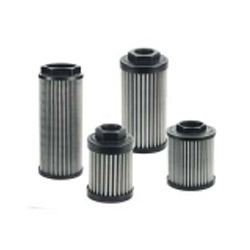 Additionally, these In Line Duplex Filters are very much efficient in performing even on elevated temperatures and pressure and hence are preferred for use in several industrial filtration systems. With the help of our highly knowledgeable personnel, we are able to supply and trade an excellent quality range of Contamination Monitoring. 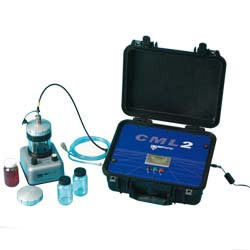 The CML is a portable, accurate instrument-suitable for 'on-site' applications utilising mineral oil as the operating fluid. It can automatically measure and display particulate contamination, moisture and temperature levels in various hydraulic fluids. These are well known for their superior performance. Analyzer is designed to measure and quantify the number of solid contaminants in Hydraulic, Lubrication and Transmission applications. The CML is a portable, accurate instrument-suitable for 'on-site' applications utilising mineral oil as the operating fluid. It can automatically measure and display particulate contamination, moisture and temperature levels in various hydraulic fluids. 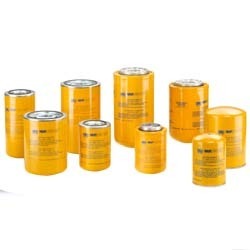 Our organization is amongst the leading supplier and trader of high quality range of In-line Filters in the industry. 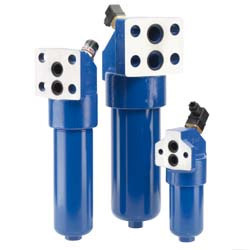 These in-line filters are highly reliable for filtering synthetic fluids, glycol and different types of aqueous emulsions used in the industry. Working pressure 870 psi, flow rates up to 80 gpm, threaded connections from 1” to 1 1/2” BSP/NPT/SAE and flanged connections up to 1 1/2” SAE 3000 PSI. 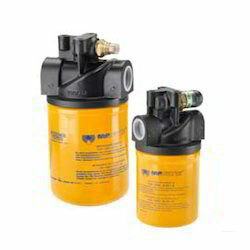 We are offering these in-line filters in various sizes. We are offering to our clients a wide range of Either Suction or Return In-Line Mounted Spin On Filter. 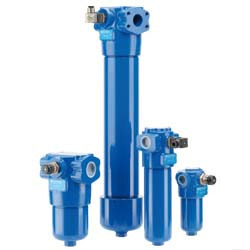 These Either Suction or Return In-Line Mounted Spin-On Filters are basically the spin-on filters which work on hydraulic pressure filtration patterns and provide the desirable filtration systems to the fluid flow systems in the industrial processes. These have working pressure 12 bar (174 psi), flow rates up to 300 l/min (80 gpm), threaded connections from 3/4” and 1 1/2” BSP/NPT/SAE and flanged connections 1 1/2” SAE 3000 PSI. Water holding capacities: - CSGW 050 - 240 ml. CSGW 150 - 788 ml. Our organization is amongst the trusted supplier and trader of premium array of In-Line Pressure Filter in the industry. These have working pressure 350 bar (5076 psi), flow rates up to 500 l/min (133 gpm), threaded connections 1 1/2” BSP/NPT/SAE and flanged connections 2” SAE 6000 PSI manifold type. Our in-line filters are very robust and long lasting with great stability and functionality appreciated for its strength and cost efficiency. These in-line filters are easily available to our clients at reasonable prices. Along with several other supreme quality industrial filters for fluid flow systems, we have also brought forth to our clients these top grade and finest quality Return Line Filter Tank Mounted in the market. In these the oil flow internal to external filtering element. The working pressure is 10 bar (145 psi), flow rates up to 2000 l/min (530 gpm), threaded connections from 1/2” to 1 1/2” BSP/NPT/SAE and flanged connections SAE 3000 PSI/DIN up to 4”. 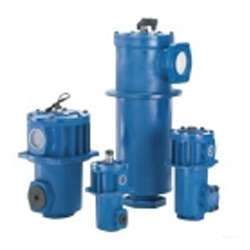 We are one of the widely known and reputed companies which are deeply engaged in the line of supply and trade of these tank mounted return filters. Oil flow internal to external filtering element. Working pressure 10 bar (145 psi), flow rates up to 2000 l/min (530 gpm), threaded connections from 1/2” to 1 1/2” BSP/NPT/SAE and flanged connections SAE 3000 PSI/DIN up to 4”. We hold proficiency in supplying an trading our clients top quality array of Pressure Line Filter Inline 420 Bar in the industry. 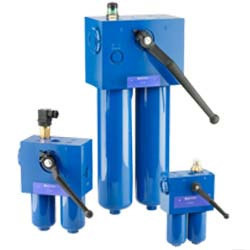 These have working pressure 420 bar (6091 psi), flow rates up to 150 l/min (40 gpm), threaded connections up to 3/4” BSP/NPT/SAE/ISO 6179. These in line filters are very sturdy and long lasting with great design for supreme installation and durability. 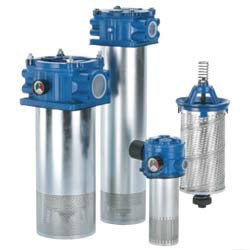 Our in line filters are very reliable available to our clients at economical prices. Keeping in mind the diverse requirements of the clients, we are involved in offering a wide range of In Lime Filter. The working pressure is 560 bar (8122 psi), flow rates up to 150 l/min (40 gpm), threaded connections up to 3/4” BSP/NPT/SAE/ISO 6179. We offer these filters in various technical specifications as per the requirements of our clients. We offer our products at reasonable prices. Other opening pressures on request. Oil flow from exterior to interior. 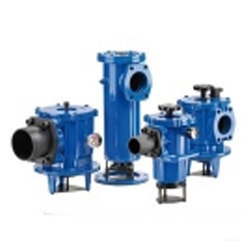 To furnish diverse requirements of our clients in best possible manner we are offering a wide range of In-Line Simplex Filter. These have modular filter, from 2 to 6 heads working pressure 435 psi flow rates up to 634 gpm flanged connections 3” and 4” SAE 3000 PSI. 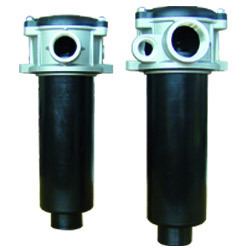 Moreover, these have excellent filtering capacity used in various hydraulic applications. Housings compatible with: Mineral oils to ISO 2943 - aqueous emulsions synthetic fluids, water and glycol. NBR seals series A, compatible with: Mineral oils to ISO 2943 - aqueous emulsions synthetic fluids, water and glycol. threaded connections 3/4” and 1” BSP/NPT/SAE. 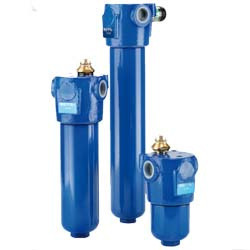 We are enlisted as top company involved in offering a wide range of Pressure Line Filter Inline 420 Bar. The working pressure of these filters 420 bar (6000 psi), flow rates up to 40 l/min (11 gpm), threaded connections up to 3/8” BSP/NPT/SAE. In these filters the curves are plotted using mineral oil with density of 0.86 kg/dm3 to ISO 3968. Additionally, we also assure to deliver our products at reasonable prices. Bodies compatible with:Mineral oils to ISO 2943 - aqueous emulsions Synthetic fluids, water/glycol. Filter elements compatible with: Mineral oils to ISO 2943 - aqueous emulsions Synthetic fluids, water/glycol. Nitrile (NBR) seals series A, compatible with: Mineral oils to ISO 2943 - aqueous emulsions Synthetic fluids, water/glycol. The curves are plotted using mineral oil with density of 0.86 kg/dm3 to ISO 3968. Our organization is amongst the leading supplier and trader of high quality range of Particle Counter Calibrated. These are ISO 11171 standard and have working pressure from 2 bar (29 psi) to 400 bar (5801 psi). Contamination reports data in ISO 4406, NAS 1638 and AS4059 formats. Offered products also have oil temperature and relative humidity reading sensors. Moreover, these also have various test programme settings. ISO 11171 standard, working pressure from 2 bar (29 psi) to 400 bar (5801 psi). Contamination reports data in ISO 4406, NAS 1638 and AS4059 formats. Oil temperature and relative humidity reading sensors. 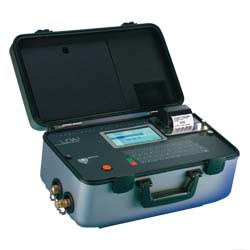 The LPA2 is a highly precise, lightweight & fullyportable instrument suitable for on-site and laboratory applications. It can automatically measure and display particulate contamination, moisture and temperature levels in various hydraulic fluids. Being a client centric firm we are involved in offering an excellent range of Suction Strainer. These have flow rates up to 900 l/min (238 gpm), threaded connections from 1/2” to 3” BSP/NPT. 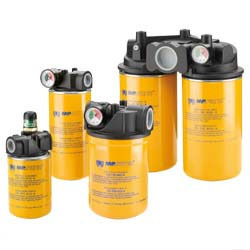 These submerged suction filters are able to provide excellent control of liquids such as water, oil and many others from exterior to interior. Additionally, clients can avail from us our range of submerged suction filters at market leading prices. To furnish diverse requirements of our clients in best possible manner we are offering a wide range of Return Line Filter Tank Mounted. In these the oil flow from external to internal filtering element. Working pressure 8 bar (116 psi), flow rates up to 750 l/min (198 gpm), threaded connections from 1/2” to 2” BSP/NPT/SAE and flanged connections up to 2” SAE 3000 PSI. Moreer, we offer these in various specifications as per the requirements of our clients. We are amongst the renowned supplier and trader of high quality range of Suction Strainer in the industry. 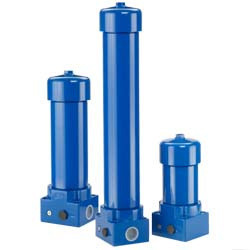 These external suction filters are used for various filtration applications that offer easy mounting in semi-immersed reservoir. Flow rates up to 550 l/min (145 gpm), threaded connections up to 1/2” to 2 1/2” BSP/NPT and flanged connections up to 3 1/2” SAE 3000 PSI. We also assure timely delivery of our products. 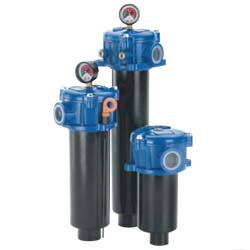 FAS series filters are designed for a variety of filtration requirements for suction applications.The particular design of these filters allows them to be mounted semi-immersed in the reservoir or inline. These filters are particularly suitable for stationary industrial applications, such as hydraulic presses, injection moulding machines and heavy industry. 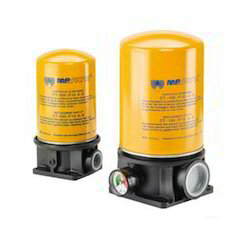 FAS series filters can be supplied with contamination indicator, either visual or electrical. can be supplied on request. Along with several other supreme quality industrial filtering equipment, we have also brought forth to our clients these top grade and finest quality Return Line Filter Tank Mounted. These Tank Mounting Semi Immersed Filters have been designed and constructed in an excellent patterns which not only makes it efficient and effective in its performance but also makes it last longer. The flow rate is 396 gpm and the working pressure is 290 psi. To furnish diverse requirements of our clients in best possible manner we are offering a wide range of In Line Filter. These are procured from the trusted and certified vendors of the market. Offered products are highly appreciated in the market due to their easy installation and fine quality. We also assure to deliver a defect free range of our products in a stipulated time frame. Clients can also avail from us our range of Suction Strainer which we supply in the industry. 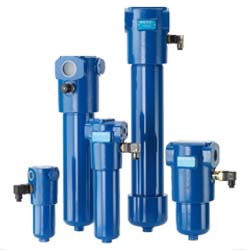 Our filters are highly reliable for filtering up to 250 micron with excellent efficiency and provide easy filter change without the need for emptying the reservoir. These filters are fitted with high quality clogging indicators which are operated in visual and electrical stiles. Avail from us these filters at market leading rates. For water-based emulsions (type HFAE-HFAS as per ISO 6743/4) and fluids other than those mentioned, please consult our Sales Network Organization. We are offering to our clients a wide range of Return Line Filter Tank Mounted. 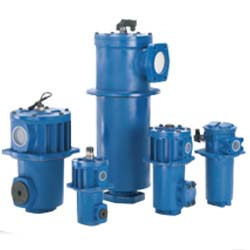 These Tank Mounted Return Filters are widely being used and appreciated in several parts of the country in different industries and are hence in very much demand in the market. Additionally, the oil flow is external to internal filtering element. Working pressure is 8 bar (116 psi), flow rates up to 200 l/min (53 gpm), threaded connections from 3/8” to 1 1/4” BSP/NPT/SAE. Oil flow external to internal filtering element. Working pressure 8 bar (116 psi), flow rates up to 200 l/min (53 gpm), threaded connections from 3/8” to 1 1/4” BSP/NPT/SAE. The filter elements are compatible with: Mineral oils to ISO 2943, Synthetic fluids Aqueous emulsions, water and glycol (series W required). 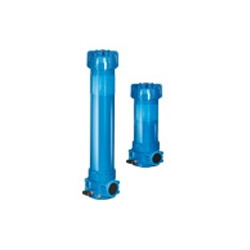 Keeping in mind the diverse requirements of the clients, we are involved in offering a wide range of Duplex Filter. These are completely tested on various parameters by our experts before they are dispatched to our clients. The filter elements are compatible with mineral oils to ISO 2943 and synthetic fluids. We offer our products at reasonable prices. To furnish diverse requirements of our clients in best possible manner we are offering a wide range of Pressure Line Filter Inline 320 Bar. The working pressure is 110 bar (1595 psi), flow rates up to 90 l/min (24 GPM), threaded connections 1/2” BSP/NPT/SAE. Offered product is available in market in different specifications as per the clients requirements. We offer our products at reasonable prices. 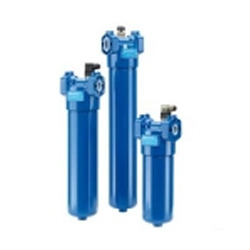 With rich industrial experience and knowledge we are involved in offering a wide range of Pressure Line Filter Inline 420 Bar. These have working pressure 560 bar (8122 psi), flow rates up to 150 l/min (40 GPM), threaded connections up to 3/4” BSP/NPT/SAE/ISO 6179. These are available in market in various specifications are available in market at reasonable prices. threaded connections up to 3/4” BSP/NPT/SAE/ISO 6179. 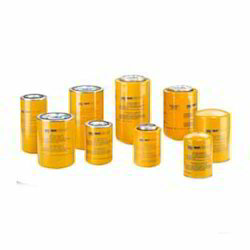 One can avail from us a wide range of Spin On Filter. 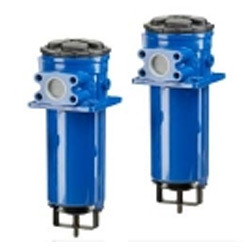 These Spin On Filter are one of the most widely used and highly demanded spin-on industrial filters which are used for the purpose of filtration and cleaning of the liquid and fluids in industrial processes. Working pressure 35 bar (508 psi), flow rates up to 250 l/min (66 gpm), threaded connections from 3/4” to 1 1/2” BSP/NPT/SAE. We also assure timely delivery of our products. In the range of our most widely accepted and appreciated products are also included these Spin On Filter which we are extensively supplying and trading in each and every part of the country. The working pressure is 12 bar (174 psi), flow rates up to 200 l/min (53 gpm), threaded connections from 3/4” and 1 1/2” BSP/NPT/SAE and flanged connections 1 1/2” SAE 3000 PSI. We offer our products at reasonable rates. With vast experience and knowledge we are engaged in offering a comprehensive range of Suction Strainer. 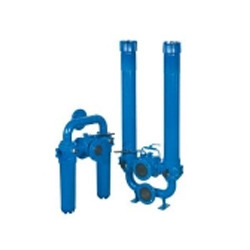 These semi submerged positive head suction filters are used for side-wall installation for oil filtration. Our filters are designed to provide efficient functionality with its convenient use and design for replacing filters without having the need to drain the oil. These filters are easily available to our clients at affordable prices. 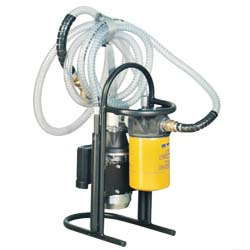 The GRF 015 is a portable oil Transfer Filtration Unit, specifically designed for both filling/transferring hydraulic oils from containers to the hydraulic tank as well as filtering and cleaning hydraulic systems. 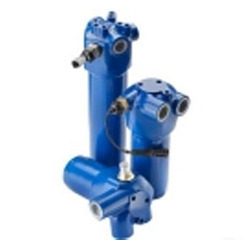 We are a leading company involved in offering a wide range of Manifold Mounted Filter. 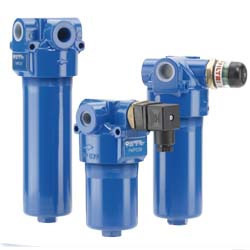 These have working pressure 320 bar (4641 psi), flow rates up to 430 l/min (114 GPM), manifold connections. We have obtained these manifold mounted filters from one of the most reliable and trusted manufacturers and are efficiently engaged in its supply and trade all across the country. Our organization is amongst the highly trusted supplier and trader of high quality array of Automatically Measures. 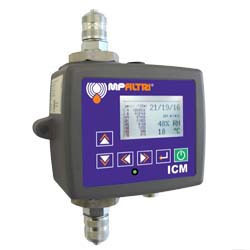 These ICM Automatically Measures and displays particulate the contamination, moisture and temperature levels in various hydraulic fluids. These have moisture and temperature sensing and are well known in market due to their competitive rates. systems, where ongoing measurement or analysis is required, and where space and costs are limited. Looking for MP Filtri Filters & Powerpack Accessories ?